I recently discovered Godai Soaps and had to share them with you. They are natural, vegan, non-GMO, certified organic and cruelty-free. 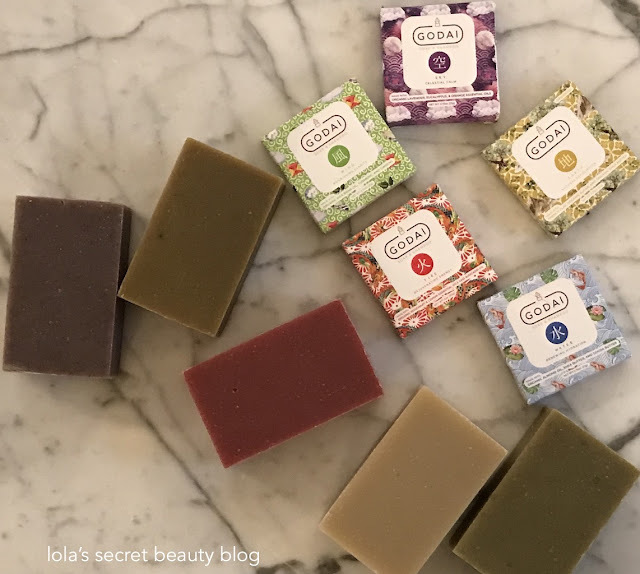 Aside from their environmentally and socially responsible practices and beliefs– their soaps are ultra-luxe, they smell delectable and they are such a pleasure to use. Each has an incredibly vibrant and beautiful aroma, except Earth– which is unscented. These beautiful soaps gently and thoroughly cleanse the skin without stripping, drying or irritating. I use them at my bathroom sinks and in my bath tub, and while some can be used on the hair as well as the skin, I primarily use them on my hands and body. Our Godai soaps draw our inspiration from the Japanese concept of the five elements of earth, water, fire, wind, and sky. It is believed that health is achieved through the harmonious balance of these elements, and our soaps are named for and inspired by each of these elemental characteristics. We are committed to using certified organic ingredients that goes above and beyond the natural soap industry norm. For example, we not only use the standard of organic base oils such as organic sunflower and coconut oils, but also use organic essential oils and scents such as organic lavender oil, sugar, lemon oil, almond oil, turmeric, and more. We believe in providing better ingredients and products over making a larger profit, and strive to offer our customers and visitors to our website with education about the soap industry and the benefits of choosing natural ingredients. Besides our certification through the Montana Department of Agriculture, a USDA Organic Certifying Agent, we are proud to say that all of our products are vegan, GMO-free, cruelty-free, and made in the USA. GODAI SOAP SKY 空 (CALMING BAR SOAP): "The Sky, or void, element represents a higher conscious state of peace and calm, and Godai’s 空 Sky Bar Soap & Shampoo draws from this element with a calming blend of lavender oil, eucalyptus, and orange oil to soothe irritation by reducing inflammation and dryness." One might think that the combination of lavender, eucalyptus and orange might be too sharp and assertive, and yet this blend is smooth, warm and comforting. Ingredients: click here. GODAI SOAP WIND 風 (NOURISHING BAR SOAP): "Wind represents the breath of life, and Godai’s 風 Wind Bar Soap & Shampoo emulates this element by using a combination of nourishing and brightening ingredients such as rice bran oil, turmeric, and barley grass powder by removing impurities from your skin and hair while moisturizing." This nourishing bar has a delectable lightly spicy green aroma– the turmeric spices up the barley grass, which in turn tempers the spice with its fresh green sensibility. Ingredients: click here. 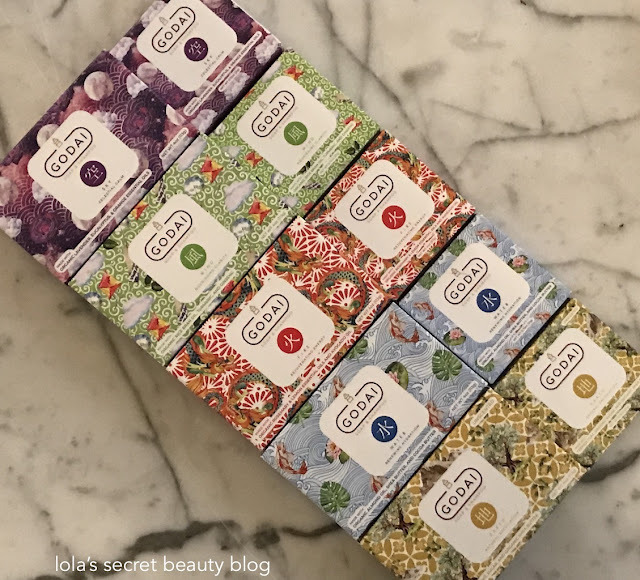 GODAI SOAP FIRE 火 (REJUVENATING BAR SOAP): "Fire is known as the transformative element, and Godai’s 火 Fire Bar Soap & Shampoo provide rejuvenation with a mixture of rosemary oil, lemon oil, and avocado oil to energize tired and dull skin for more brightness and vitality." This soap has such a magical aroma the rosemary adds some depth while the lemon and a bright and cheerful zest, and it is at once uplifting and fresh. Ingredients: click here. GODAI SOAP WATER 水 (MOISTURIZING BAR SOAP): "Water is the element that is necessary to all life on Earth, and Godai’s 水 Water Bar Soap & Shampoo mirror this element through a hydrating mix of organic cocoa butter, shea butter, and white clay to provide a smoother, healthier complexion." The sweet orange, tangerine and ylang ylang oils create a rich, smooth, and creamy aroma that is punctuated by the citrus notes that are neither too assertive, nor in the least bit cloying. Ingredients: click here. GODAI SOAP EARTH 地 (CLEANSING BAR SOAP. UNSCENTED): "Earth acts as the base element upon which all rests, and Godai’s 地 Earth Bar Soap & Shampoo represent this element by combining ingredients such as French clay and organic sugar, gently yet deeply cleansing to provide a foundation for healthy, glowing skin." If aromatic infusions aren't for you, then this unscented soap will appeal to you. Ingredients: click here. 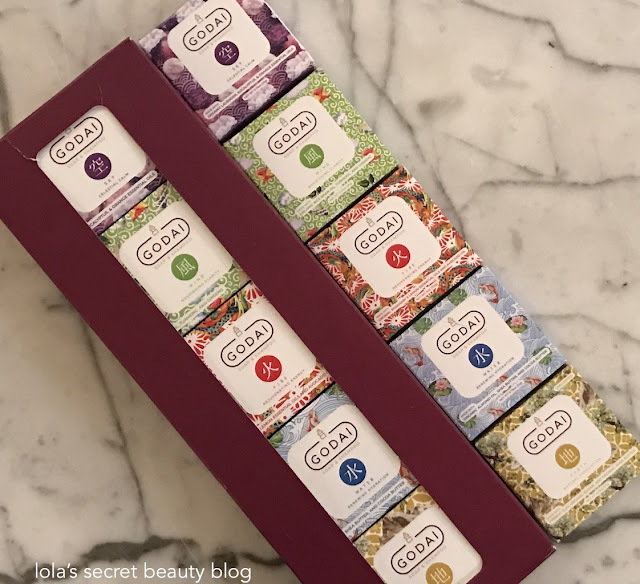 Overall Assessment: If you are seeking high quality bar soaps that are a pleasure to use, and are natural, vegan, non-GMO, certified organic and cruelty-free– then I think the you will really enjoy Godai Soaps. $31.95 for Godai 5 Bar Complete Gift Set (4 oz. each), $6.50 for Single Godai Soaps (4 oz.) and $2.99 for Godai Sampler Soaps (0.75 oz.) (Unaffiliated Links). 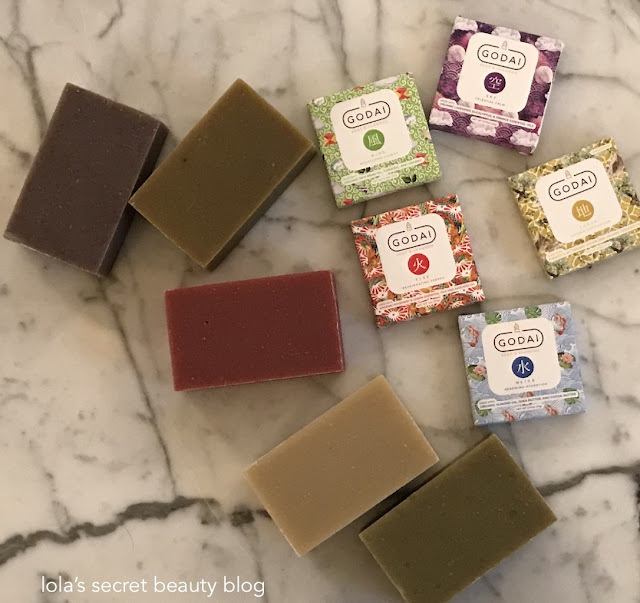 As a bar soap fan, I would love everything about these gorgeous soaps! The Japanese paper wrapping is beautiful. I think that you would be incredibly impressed, Allison! They smell delectable and they don't strip the skin! Those sound nice- would make a great gift! They are really lovely, and they are perfect gifts! The packaging is beautiful on these. Of all the scents I think the Soap Water sounds the best. I agree about the packaging, it really is beautiful. The scents are really lovely, and the citrus notes in Water are so nice! I love the sound of the scents of Fire and Water. Those two are really wonderful, and I think that you would really enjoy them. So do I, and I just can't get enough of them! I used to do the same thing and just collect them and place them in my sock drawer, but more recently I decided to use them no matter how beautiful they are, and I have really loved elevating my experience of bathing and washing my hands using lovely soaps!